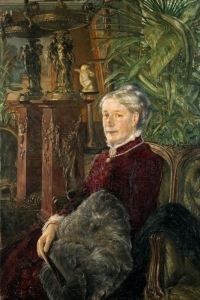 Göthilda Fürstenberg was an art collector, along with her husband Pontus Fürstenberg. She was one of the most important patrons of art in Sweden. Göthilda Fürstenberg was born in 1837. She was the only child of Eduard Magnus and Rachel Magnus, who were cousins. Eduard Magnus was a wholesale merchant and gained his wealth through the sugar industry and lending credit. He founded a bank in Gothenburg and through his investments in the textile industry he also had business ties with the company L. Fürstenberg & Co., in which the son Pontus Fürstenberg eventually became a part-owner. The Fürstenberg and Magnus families socialised together, had mutual financial dealings, lived near to one another, and were members of the same faith group, namely the Mosaic congregation in Gothenburg. Through these contacts Göthilda Fürstenberg met her soon-to-be husband Pontus during her youth. When Pontus proposed to Göthilda she was in her 20s. Eduard and Rachel Magnus were against the marriage, however, and Eduard Magnus, who was his daughter’s guardian, put his foot down. The apparent reasons for this were that Pontus was 10 years his daughter’s senior, was considered to be facile, and he also had a humpback. It was not until Göthilda Fürstenberg’s parents had passed away that the marriage could take place, as it did in 1880. Pontus and Göthilda Fürstenberg never had any children. Although Göthilda Fürstenberg’s parents’ had made provisions for donations to charities in Gothenburg and they had financially supported the city’s musical and artistic life, her inheritance was still substantial. In addition to the family’s property (the current Palacehus) Göthilda Fürstenberg inherited a sum of around 3.5 million kroner, which at that time was an exorbitant amount. Göthilda Fürstenberg’s education had been of the form expected of a bourgeois girl of a certain standing. Musical and artistic aspects obviously featured, but in her case basic elements of financial management had also been included. Göthilda Fürstenberg’s inherited wealth thus stood a good chance of being astutely managed. Her husband Pontus was not as rich as she was but neither was he poor. Together they formed the richest couple in Gothenburg. Göthilda Fürstenberg’s interest in art had developed from an early point as a result of her parents’ involvement in the town’s cultural life. Further to that she was related to Ernst Josephson, who at that time was a representative of the radical element amongst contemporary artists and would become an artistic advisor to the Fürstenbergs. In conjunction with their marriage the couple began a fulltime enterprise as art collectors and supporters of the town’s artistic spheres. Pontus Fürstenberg was a member of the Sällskapet Gnistan (Gnistan society) exhibition committee who organised an art exhibition in 1881. An important basis of the Fürstenbergs’ art collection was garnered through this exhibition, which also served as a breakthrough for naturalism in Scandinavian art. Pontus Fürstenberg was formally active in the official spheres of town life whilst Göthilda Fürstenberg mainly became known later through her inherited capital. She is described as ‘the inheritress’. In reality, however, the Fürstenbergs operated as a couple in most regards. They shared an interest in art and activism on behalf of the artists. Together they opened up Gothenburg to external influences within art. The Fürstenbergs went to Paris, Germany, Italy, and Copenhagen. They studied and acquired art during their overseas travels and made their acquisitions publically accessible at their Södra Hamngatan 2 gallery, whilst their home served as a meeting place for the radical artists of the time. The Fürstenbergs particularly admired and supported the art of the so-called Opponenterna, whose criticisms were directed towards the conservative Konstakademi (academy of art). Gothenburg university library contains a large collection of preserved correspondence from artists who later became famous, such as Carl Larsson. The collections also contain letters such as those Göthilda Fürstenberg wrote to her many relatives in the Magnus and Fürstenberg families. In addition to her engagement in Gothenburg’s art and cultural life Göthilda Fürstenberg also undertook charitable work through a foundation which was dedicated to her father’s memory. Göthilda Fürstenberg died on 7 December 1901 and Pontus Fürstenberg died just over four months later. They are both buried in the Mosaiska cemetery at Friggagatan in Gothenburg. The Fürstenbergs willed the Fürstenberg house to Gothenberg city, and also gave the city the right to sell the property. The art collection was donated to Gothenburg museum but was later moved to the art museum at Götaplatsen (a museum which was funded by the proceeds from selling the Fürstenberg house). The will also made provisions for financing the Gothenburg orchestral association, as well as for several charities. The floor of the Gothenburg art museum which houses the Fürstenberg couple’s art collection today also contains some of the furniture from Pontus and Göthilda Fürstenberg’s home. Thus the art collection is framed in the same patrician environment in which it originally existed. Göthilda Charlotta Fürstenberg, www.skbl.se/sv/artikel/GothildaFurstenberg, Svenskt kvinnobiografiskt lexikon (article by Maria Sjöberg), retrieved 2019-04-26.